I recently got the chance to attend the launch party for a fun, new iOS party-themed game called Emoji Charades. Produced by GameCake Studios, Emoji Charades looks like it’s a great game for the party set who are looking for fun party-themed games for their events. One thing I believe GameCake has captured really well here is making an appealing party-themed game for mobile devices. It’s not something you are seeing in huge supply of right now. You see mobile games of all various types. There are mobile RPGs. There are remakes of classic old-school titles. There are even mobile MMOs. But there isn’t many great party type games you can think of off the top of your head. Emoji Charades definitely has the potential to capture that portion of the market place. Emoji Charades, like the title says, is a digital version of the classic party game, Charades, but with an emoji twist. Players act out the charades by giving their teams or opponents clues with emoji clues on a screen. The players then have to try and think of the answer correctly based on the emoji clues that are on the screen. What’s the catch? For any given question in a category of trivia, there is only a limited number of real emojis to choose from. That makes it more difficult for the player who is trying to select the emoji clues and symbols to give to his teammates to get the right answer. The emojis that are available for the games in different categories are all curated by the GameCake team. I’m told that they are definitely into community feedback and plan on making adjustments to the game and emoji characters that are available based on player feedback. That aside, playing the game with only a limited number of emoji characters to choose from makes it more challenging for the player who is using the emoji remote screen. You have to think hard about using the best symbols to clue your teammates onto the answers. Emoji Charades is not really a solo mobile game. It requires two screens to play. One player gets the “answer” and has to use their screen to send the emoji symbols to another iOS device screen. Then the players competing have to guess the correct answer like in charades. It’s very simple, uncomplicated and really easy for anyone to pick-up-and play. What’s appealing about Emoji Charades is that it has a simple, yet appealing, quality. The animation and graphics are very crisp. It’s like a nice trivia game. It’s a game that families can play together at a party. Adults can play it for a game night. Kids can play it at a party together. Parents can play this game with their kids. Emoji Charades has a nice all-ages appeal and quality to it. There are various categories to choose from. Players can take on movie or entertainment trivia. There is sports trivia and food trivia. At launch, there are 11 different trivia packs for the game. Additionally, the game works great with Apple TV. 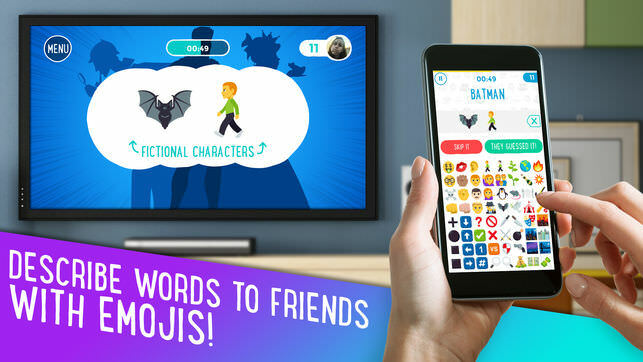 So, the game can be set up in a main room HDTV for a whole room of people to view and try to answer the charades questions, and then players can use an iPhone or Tablet as like the remote controller for the emoji characters. Testing the game out at the event was very simple and a lot of fun to do. So, if you are looking for a fun, modern twist on a party-themed classic, Emoji Charades is a cheap and easy option for you to look into for your next gather or event. Emoji Charades is available now for iOS devices at the App Store. It’s only on iOS for now, but based on my conversations with the GameCake team, they would like to make it available for more devices, such as Android, in the near future.